Mumbai, March 18: The Maharashtra Congress on Monday urged the Election Commission of India to act against Prime Minister Narendra Modi for the Bharatiya Janata Party's latest campaign, 'Main Bhi Chowkidar', an office-bearer said. In a letter to the ECI, the state party secretary Taufiq Mullani has said that in the video of the new campaign - which is viral on social media - Modi has been shown riding on an Army tank, and interspersed with clips of the Indian soldiers fighting. "This is a blatant violation of the ECI's order of March 9, 2019, reiterating its earlier directive of December 2013, prohibiting display of pictures of defence personnel or defence-related events for election campaign and political propaganda," Mullani told IANS. PM Narendra Modi Shares 'Main Bhi Chowkidar' Video Song to Kick-Start BJP's Campaign For Lok Sabha Elections 2019. The party pointed out that on one hand, Congress President Rahul Gandhi stood solidly behind the government in the wake of the Pulwama attacks, on the other, the BJP is "taking credit for the sacrifices of the soldiers and exploiting it politically during elections" through the Main Bhi Chowkidar' campaign. 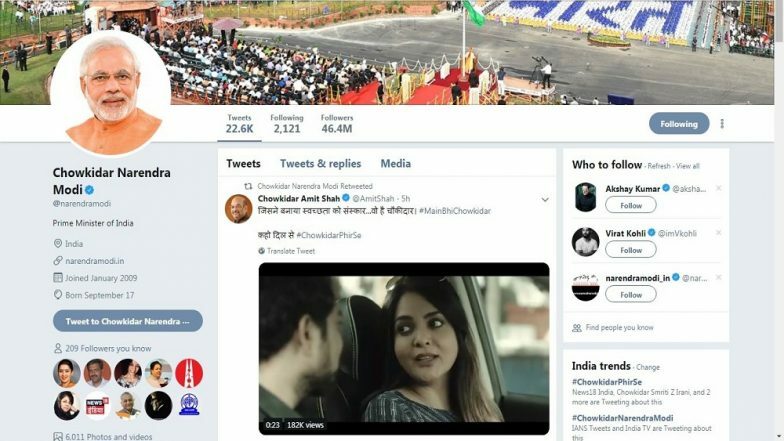 Attempting to turn the tables on the Opposition parties, Modi on Sunday launched the 'Main Bhi Chowkidar' campaign and changed his Twitter handle name to 'Chowkidar Narendra Modi'. Soon, several party bigwigs and ministers also followed suit and prefixed their Twitter handle names with the word 'Chowkidar' (watchman).